Thaw out with this simple, hearty soup. Make it ahead of time and enjoy its warmth when you need it most. Bring all ingredients except cheese to boil in saucepan on medium-high heat; simmer on medium heat 6 to 8 min. or until macaroni is tender. Substitute no-salt-added kidney beans for the chickpeas. Prepare using any other short pasta shape, such as shells or penne. 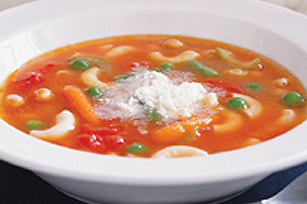 Help your friends and family eat right with this delicious soup that provides a good source of iron, per serving.